Doha, Qatar – October 15, 2017: Climate change was the center of discussion during a week-long visit by distinguished journalists from the Pulitzer Center on Crisis Reporting to Northwestern University in Qatar (NU-Q). As part of an annual visit to NU-Q to raise awareness of journalism campaigns that focus on global issues, three international reporters who specialize in reporting on climate change, shared their experience and discussed the future of the environmental issue. As part of a presentation to the NU-Q community, Eli Kintisch, a contributing correspondent for Science magazine and author of Hack the Planet: Science's Best Hope — or Worst Nightmare — for Averting Climate Catastrophe shared his personal experiences covering the Arctic, where glaciers are melting, temperature is drastically increasing, and the wildlife is being severely affected. NU-Q is one of 30 international universities who partner with the Pulitzer Center to foster greater discussions around prevalent global issues and to involve students in projects and fellowships aimed at analyzing worldwide areas of concern. “The Pulitzer Center’s mission is to support journalists who are covering urgent issues and to improve coverage on global issues. NU-Q is committed to educating our students on the importance of accurate and objective reporting, as well as exposing them to the realities of crisis reporting. We have had great success in partnering with the Pulitzer Center, which has also provided our students with fellowships and journalism residencies in Washington D.C.,” said Everette E. Dennis, dean and CEO of NU-Q. In addition to Kintisch, this year’s visiting journalists included Ako Salemi, an award-winning photojournalist from Iran who documents the impact of climate change on Iran’s desert landscape and the region surrounding it, and Janice Cantieri, a Northwestern alumna and Fulbright-National Geographic digital storytelling fellow who most recently reported on the impact of rising sea levels in Kiribati, an island in the South Pacific. Accompanying the journalists was Tom Hundley, Pulitzer Center senior editor, who has almost four decades of experience as a foreign correspondent for the Chicago Tribune. He served as the Tribune’s bureau chief in Jerusalem, Warsaw, Rome, and London, and reported from more than 60 countries, including three wars in the Arabian Gulf, the Arab-Israeli conflict, and the rise of Iran’s post-revolutionary theocracy. 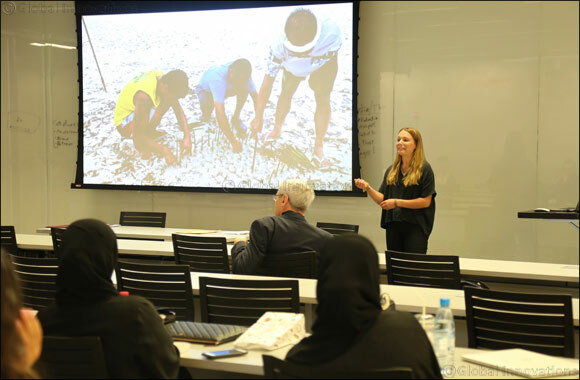 During the presentation at NU-Q, Cantieri discussed her experience covering the daily struggles of a third-world nation in the South Pacific where rising temperatures and sea levels are literally life threatening.